Markus Persson thinks of himself as more of a programmer than a game designer. "I don't spend a lot of time on mechanics," the creator of the hit sandbox/adventure hybrid says. " I play [Minecraft] more than I write it, because I want to make sure the things you can do in the game can be fun." 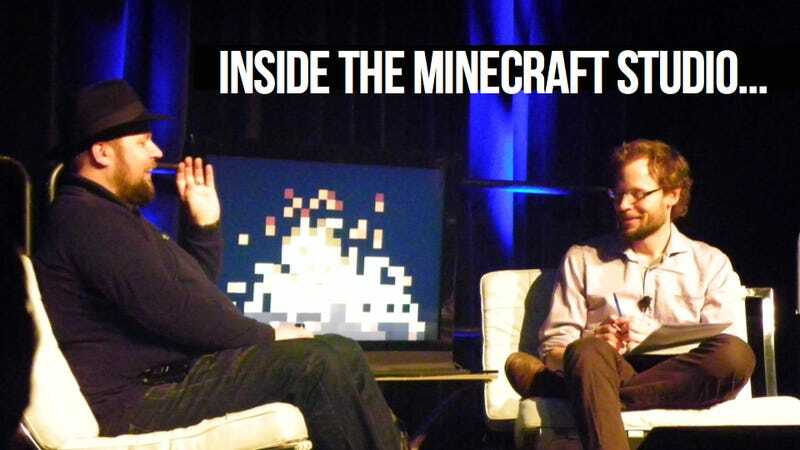 During a GDC chat where game designer Chris Hecker in front of a crackling pixellated fireplace, the Mojang CEO talked about his design philosophy and the pleasure of building an experience that surprises even him, months after it's gone out into the world. One such surprise involved an update to monster AI and running through a forest recently made more dense. As he wandered around, Notch came upon a herd of bulls chasing sheep. "They left me alone," Persson reported, elaborating that he expected the aggressive animals to attack him but they just swept on by in pursuit of the sheep. Rather than tweak the bulls so that they'd behave differently, Notch left them as they were. Then, he said, the Minecraft team seeds elements like this across the game to make sure people can run across it, as opposed to forcibly directing them towards it. Instances like that are where the randomness of emergence trump anything you could have written into a game. When talking about the tensions between a game's theme and its systems of mechanics, Persson said, "systems are important but the theme gives importance to things that happen in the game." "It drives what the player wants to do. [For example,] a laser gun has a different use than a sword," he continued. "Theme can be a shortcut to mechanics but, for me, but the mechanics take precedence." Using the example of indie hit Dear Esther, Notch said "theme sets expectation for the player," explaining that The Chinese Room's interactive story is more about story than mechanics, for example. Being a programmer changes the way he plays, Persson said, because he's always analyzing. Name-checking another indie hit, Notch said that he really enjoyed Amnesia: The Dark Descent, "because I can get lost in the gameworld." Asked if there's anything he regrets adding to Minecraft, Persson replied that he laments the inclusion of half-blocks. "[It's] because people want them in all materials and you're doubling the amount of blocks of the game," he explained. "You can't remove half-blocks, because people have already built their structures. You can't have them load a world and have half the structure be gone. If it breaks cool structures that people have made, then we don't change it." "I play the base game every time something gets changes or added," Notch reported, saying that having a reason for running around—a story mode—changes the experience, changing graphics changes it. Reflecting on how his connection to the game he created has changed, Persson offered that he's having more fun now, but is hoping to get back to being a programmer. "I became the public face kind of by accident but I identify as more of a programmer than a game designer," he said. "Game design is weird. You can't really tell if someone is right or wrong."